Like many other workplace safety items, electrical equipment and safety device technologies evolve and change almost constantly. That's why the National Fire Protection Association (NFPA) releases an updated version of its NFPA 70E: Standards for Electrical Safety in the Workplace every three years. And 2018 brings a new, updated version intended to help you comply with OSHA 1910 Subpart S and OSHA 1926 Subpart K.
The 2018 edition of NFPA 70E reflects the latest information about the effects of arc flash, arc blast and direct current (DC) hazards, and recent developments in electrical design and Personal Protective Equipment (PPE). The 2018 NFPA 70E emphasizes the need to use the hierarchy of risk controls, by moving it from an informational note into the text of the Standard. NFPA 70E now explicitly states that the first priority must be the elimination of the hazard. Extensively revised Article 330 on lasers now focuses on safety-related maintenance issues rather than issues associated with laser use. A "qualified person" is required to complete a Job Safety Analysis (JSA) before starting work. New article 130.7 (C)(16) personal protective equipment conformity assessment is intended to promote consistency regarding personal protective equipment testing. The conformity assessment would be effective on Jan. 1, 2018. Electrical safety programs must include a section on how to investigate an incident/accident. Make sure all "qualified workers" have access to the 2018 NFPA 70E standard. Ensure your electrical safety program is updated. Schedule on-site NFPA 70E electrical safety training. This standard addresses electrical safety-related work practices, safety-related maintenance requirements, and other administrative controls for employee workplaces that are necessary for the practical safeguarding of employees relative to the hazards associated with electrical energy during activities such as the installation, inspection, operation, maintenance, and demolition of electric conductors, electric equipment, signaling and communications conductors and equipment, and raceways. Installations used by the electric utility, such as office buildings, warehouses, garages, machine shops, and recreational buildings that are not an integral part of a generating plant, substation, or control center. 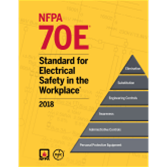 Order the 2018 edition of NFPA 70E here. Visit the OSHA electrical safety page.